While lot 475 (ex Madam Nash) was popular with buyers pre-sale, Kelly was “over the moon’’ when the filly reached $350,000, selling to Orbis Bloodstock. It was the highlight lot on another solid day’s trade, which has seen the overall sale clearance settle at 82%, with an average of $77,909 with one day of Book 1 remaining. 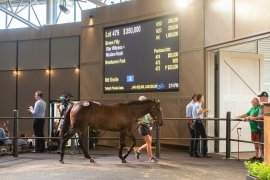 “Fillies have sold very well at this sale overall and while I suppose I wasn’t expecting that to be the case necessarily, we’re thrilled with the level the Star Witness filly got to especially,’’ Kelly said. The filly (pictured) will remain in Australia and be trained by Kim Waugh who Orbis – the Hong Kong-based company – gave today’s leading purchases to. “It’s great that Orbis Bloodstock are here supporting the Australian market and supporting Kim Waugh, it’s a great opportunity for her and we’re sure the filly will get a great opportunity there,’’ Kelly said. Orbis’ representative Paul King described lot 475 as the filly of the sale. “I had three or four good looks at her and loved the way she looked and behaved each time,’’ King said. “The fillies we’ve bought will obviously stay here and not all the colts will head to Hong Kong to be honest,’’ King said. Today’s top lot for Star Witness sees the Widden stallion feature in two of the top three lots for the sale overall, including the sale topper to date from Noogee Park. “He’s that sort of stallion. The market realises there is a premium for proven stallions and he’s a gun proven stallion,’’ Widden’s Antony Thompson said. Today’s equal-second top lot was a Dissident x Keep Me Warm colt from Sledmere Stud, which George Moore purchased for $280,000. “He was the star of our show all the way through, we knew that all along,’’ Sledmere’s Roy Murphy said. “George was very keen on this horse from day one. He told us early it was one of the nicest horses he’d seen at the complex this week. To view our Inglis TV story on former Group 1-winning jockey turned breeder Scott Seamer, who has had two horses sell through the ring this sale, CLICK HERE. To view our Facebook Live end of day review, CLICK HERE. To view all statistics from the Classic Sale to date, CLICK HERE.